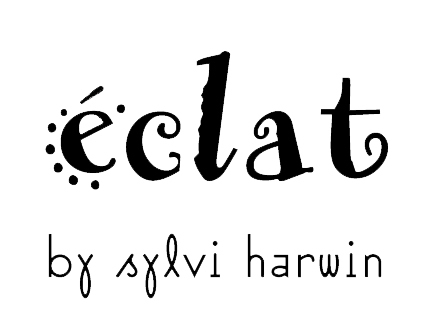 Sylvi Harwin’s eyeglass leashes are all 27 inches long, and available in a variety of color combination. The metal -- anodized aluminum -- is dyed and since the color penetrates the metal, the color is permanent. The strap is leather and very durable. The grips are adjustable and split rings are used so that the leashes will not pull apart. Asymmetric uses 6 main wire shapes, colors asymmetric. We draw from a total of 12 shapes so there is a tremendous variety in the finished product. Shown in Caribbean. As badge holder add “-BA” to style number when ordering & an additional $1.00. 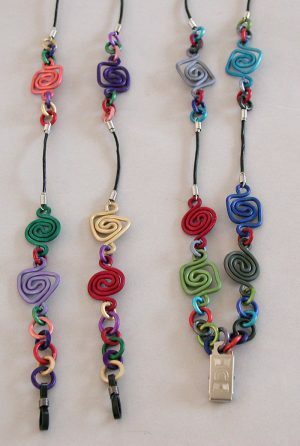 Eyeglass leash 27″ long with six different wire shapes and colors, arranged asymmetrically. Shown in New Cool. 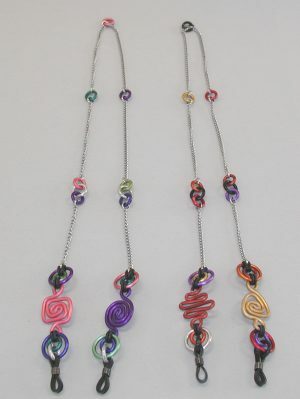 Asymmetric eyeglass leash on chain with six colors. 27″ long. Shown in Brittany (left) & Hot. 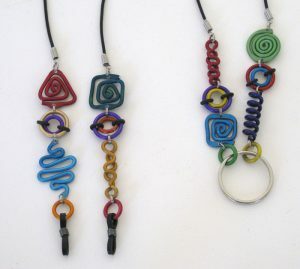 Eyeglass leash 27″ long, with two wire shapes arranged asymmetrically. Shown in Odessa (left) & Josephine. Asymmetric eyeglass leash, 27” long with 3 wire shapes each side. Multiple shapes. Shown in Marrakech & Hanalei (Badge Holder). 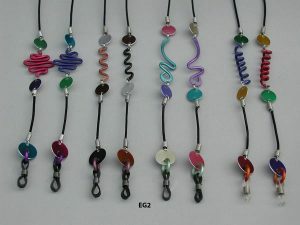 Eyeglass leash 27” long with asymmetric wire shapes & multiple loops in 6 colors on leather cord with adjustable eyeglass grips. Shown in Provence & Rainbow (Ba). 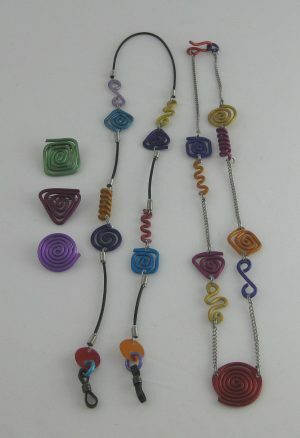 Eyeglass leash 27” long with 8 wire shapes arranged asymmetrically, space by ear. 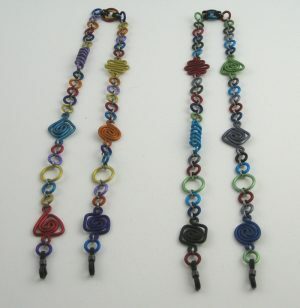 Shown in Marrakech & Hot, with $10 pins to convert eyeglass leash to a necklace. 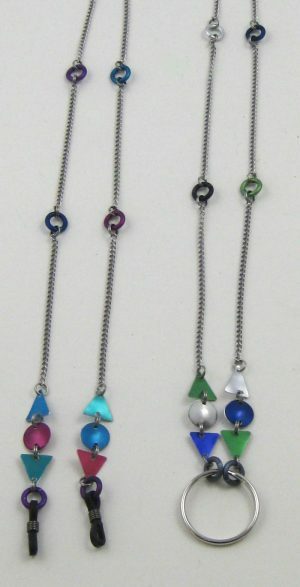 Eyeglass leash 27” long on stainless steel sports chain with adjustable grips, colors arranged asymmetrically, shown in Cool & Manhattan (Ba). 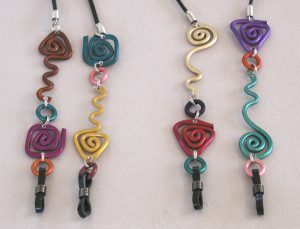 Eyeglass leash 27″ long with 1 wire shape & discs, colors arranged asymmetrically, with a length of leather by the grip so your earrings can still be seen without competition from the lanyard. 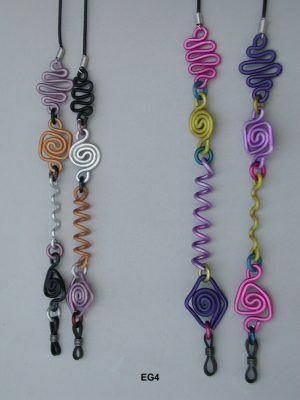 Uses 2 main wire shapes, colors are asymmetric, we draw from a total of 8 shapes. Shown in color Hawaii. Asymmetric uses 4 main wire shapes and aluminum rings as connectors. Shown in Basic & Candy. As badge holder add ” -BA” to style number when ordering & an additional $1.00.